Free WiFi internet access, Free on street parking, 20 seater private screening cinema Children welcome from any age. Royal Harbour Hotel sometimes limits bookings to 2 or more days. Room with double bed with sea view. these rooms are on the smaller size, called Cabin rooms. Cabin Double sometimes limits bookings to 2 or more days. 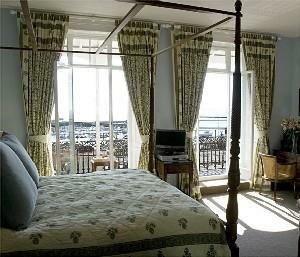 Suite with four poster Super King size bed with sea view, 2 balconies, working fireplace, PC, internet, radio in bathroom/shower. Room with double bed and pull-out sofa bed. Upper Deck sometimes limits bookings to 2 or more days.